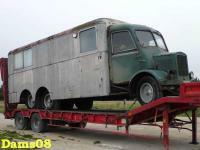 On the AEC Regent MkIII bus chassis the Merryweather company had been producing fire engines since 1950 to 1956. Totally 139 such trucks were made, half of which (62 pcs) were used in London. The AEC Regent fire engine chassis were assembled at the Maudsley Motors Coventry Works and the coachwork was built at the Park Royal Coachworks in London. It was the first post war diesel fire engine and had a carrying capacity of 100 gallons of water, with the ability to pump 1000 gallons a minute from its midship pump. The same chassis was used for making several fire ladders.